The number is a multiple of 11. The tens digit is less than the ones digit by one. The tens digit is less than the ones digit. The tens digit is greater than the ones digit. In this page, we are going to discuss about case one, where the number is a multiple of 11. 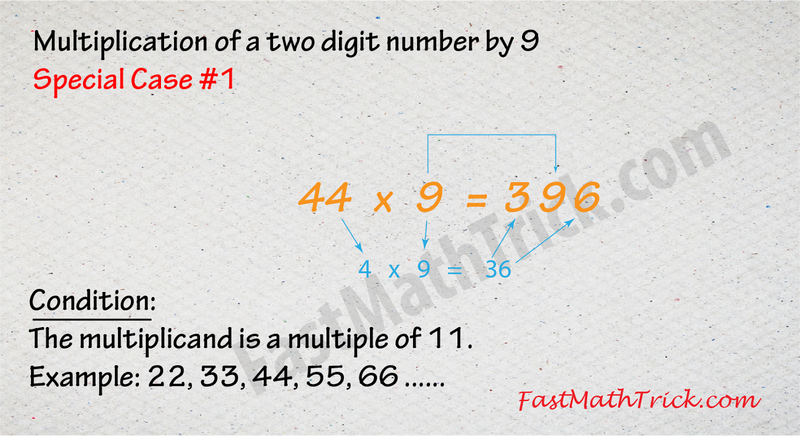 The multiplicand is a double digit number and also a multiple of 11. 44 x 9 = ? Let's say the answer is x. x must be a 3 digits number. The digit in the middle must be 9. 22 x 9 = ? 88 x 9 = ?